I grew up knowing summer to be the pungent smell of saltwater air that envelops the east coast oceanfront towns. 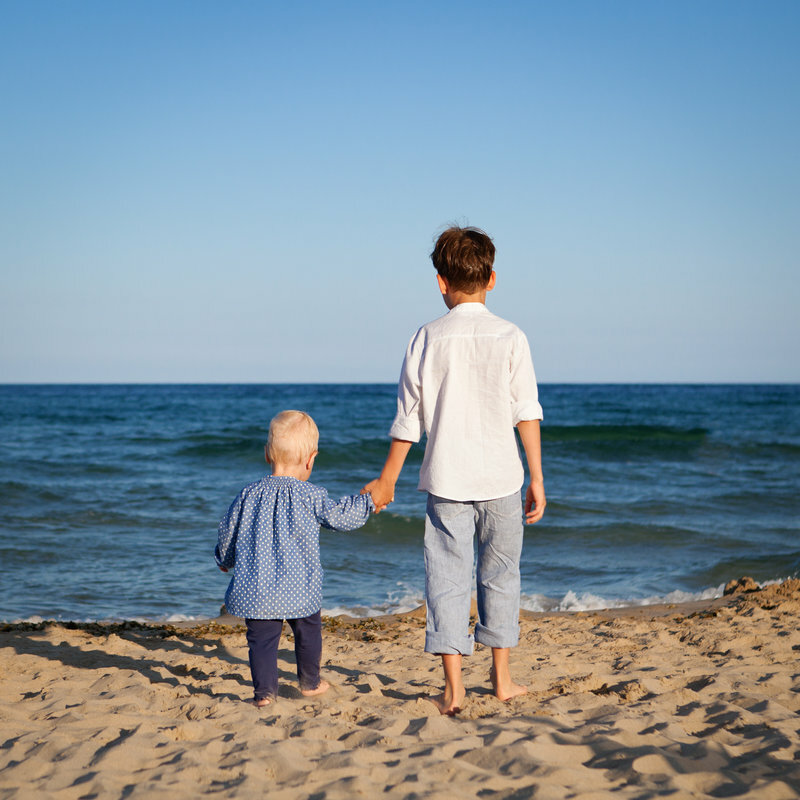 We spent only one week per year at the beach, but my memory of those weeks overshadows swim lessons and day camps and bike rides to the neighborhood pool. Grains of sand embedded themselves in the seat of my bathing suit all summer as a reminder of the week when we rode the waves of the ocean until my mom called us in for dinner. The summer after I asked Jesus into my heart, I couldn’t wait to get back to the beach — it was as if the air was thinner there. I could talk to God more freely sitting on the sand floor (that He made) and under the intangible sky (that only His hands have touched). He’d been there all along, but this year I wanted to hear from Him. Everything was brighter that summer. When I was fifteen, we hiked to the top of the Adirondack mountains, right up through the clouds and we took pictures that turned out fuzzy because we were shrouded in by them. As I type, I can still feel in my bones that last stretch when I really wanted to quit and then how quickly I forgot it when we saw the view from the top. The altitude pressed in on my lungs but I could breathe Him in up there. I realized there that the noise below had competed. I knew it was time to leave the ministry (one with which we’d been involved for nearly ten years) when I landed by a pool of gurgling water in the Virginia woodside. Years previous, God had led me to Genesis 2:25 (gasp!) to whisper to my heart that I would marry this no-more-than-a-friend, Nate, when I was alone and sprawled out on a blanket at Beaver Creek. And a decade later I felt the sovereignty of His leadership while we prayed while wrapped in summer’s evening musk for our daughters — who were under the same sky but on another continent. My best memories were unscheduled and often happened outdoors. I barely remember holding the honors diploma over which I spent four years sweating or how it felt when I finally got that A in calculus. I’ve never re-read what people wrote in my yearbook. Throughout my life, my sweetest encounters with Him have been in those pockets of His creation that didn’t include a scrolling feed or an off button or an A+. And the beauty of summer is that it’s permission to put a grand ol’ pause on the high-speed chase of a world that’s skulking after our hearts and the hearts of our children (those hearts that were created to imbibe Him slowly and over years). 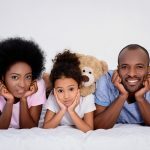 It’s permission to practice putting a grand ol’ pause on the parts of our minds that have slowly begun to believe that a successful life is a jam-packed schedule, an instant tap into what’s happening RIGHT NOW, or soaring test scores and first place trophies. It’s permission to find pockets of His wonder — for us and for them — that won’t show up on a feed. Summer is sand-filled bathing suits and the dirt from yesterday’s weeding still underneath your fingernails. It is His beauty in the interruptions and the freedom that comes when our control and our order is trumped by holy distraction. It’s stopping to notice His handiwork in a one-hundred year old tree. It’s her head on your shoulder, just before you planned to tuck her in, asking the question that the canopy covering of night has made safe for her still-shy heart to ask. It is the butterfly that landed right smack dab in his hand and slowed your family walk to a halt. Summer is catching fireflies in our nightshirt after bedtime. 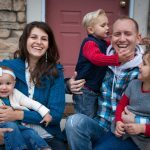 It’s where we see that letting go of schedules and lists and even the necessary order for running a home opens our eyes to the rushing wind of His Spirit. 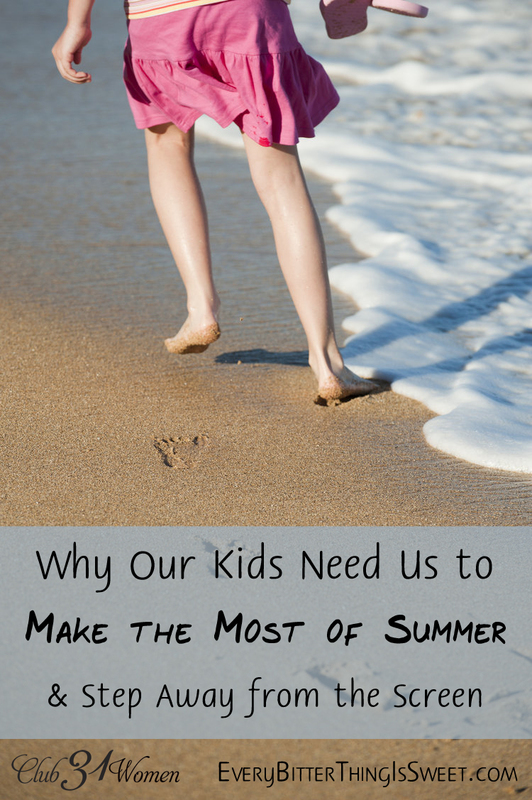 Summer is the unplanned – not what was interrupted but what did the interrupting. Summer is a chance for me and my children to see Him and His Holy Spirit, anew. Our God is a God of seasons and summer, for me, is an early (inviting) taste of finding Him in the unexpected. Our fingernails are dirty and we’ve brought half the beach’s sand home in our car, but I’m finding the wonder of God outside my four walls and too-limited flesh and praying they’ll do the same. Let your children climb high trees this summer and swim in waters too deep for your mama-fears. Take a break from expectations you’ve had of their output or external success and ask Him what His dreams are for them. Unplug your computer and let that inbox get bloated while you hike up your shorts and catch crawdads in the creek up the road from your house. 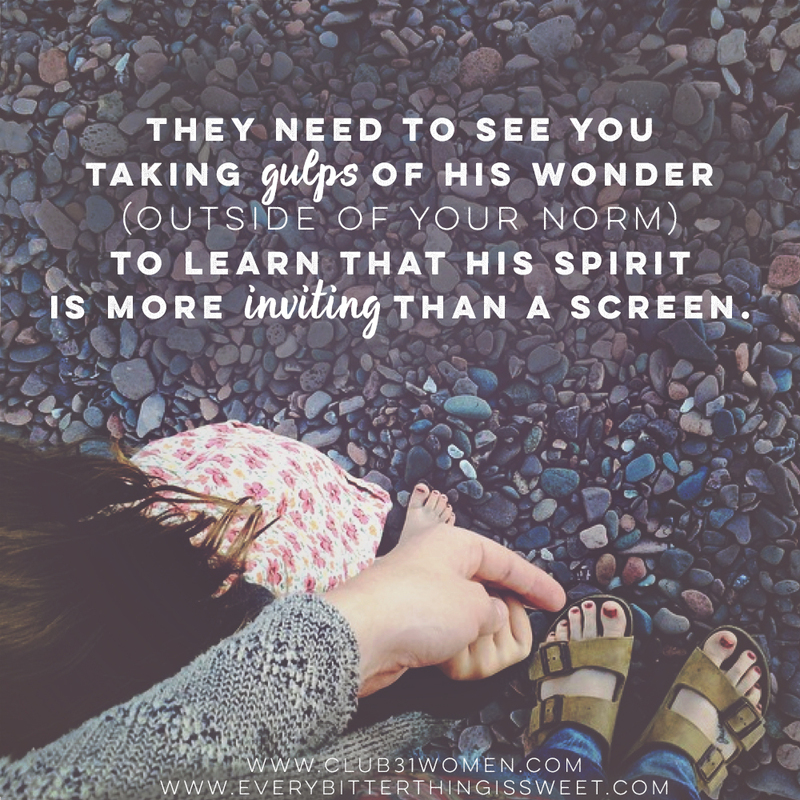 They need to see you taking gulps of His wonder — outside of your norm — to learn that His Spirit is more inviting than a screen. Bake cookies after bedtime and watch for shooting stars. Hold them tight and let them watch you let go a little bit. Summer is for falling in love with our God, anew. Summer is for holy undoing and His holy reclaiming of the parts of our hearts that find Him outside of our technologically-oriented and driven world. I have tears in my eyes as I read through the last few lines of your post. How it resonates in my heart. And it hits home, since I struggle with the screentime/time with God ratio. I’m afraid I choose the screen more often then I should. I’ve had the inspiring example of a mom who would always choose Jesus above anything or anyone else, no matter what the cost, and I’ve witnessed the fruit it yielded in her life, to the very last day. And it still yields fruit in mine. It drives me to be the same example to my daughter, yet being an example without an example for myself is often discouraging. 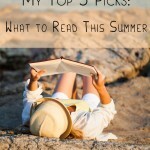 Your writing is a great reminder to check myself on what really matters, not only in summer but year-round. Thanks! Marta, Love how you express your heart here. Praise God for your mom …I want to be that kind of picture for my children! Thanks Sara! It’s a high calling we have! Thanks for sharing that beautiful reminder. You have put into words a lot of things I have felt before but never expressed. 🙂 thank you! What a beautiful reminder. Thank you so much. I’m going to reread this again this afternoon to help it soak in a little deeper. Happy summer!